Thank you for considering a donation to our creative efforts. Take a look at our incentive levels below. We hope you'll find one that you like! We've tried to answer some common fundraising questions below, if you have any questions, please feel free to send an email to info@bangtribe.com. and our eternal gratitude. Sticker is 5x3.25 inches big and kiss cut . plus a ¡BANG! sticker, and our eternal gratitude. plus a pair of ¡BANG! 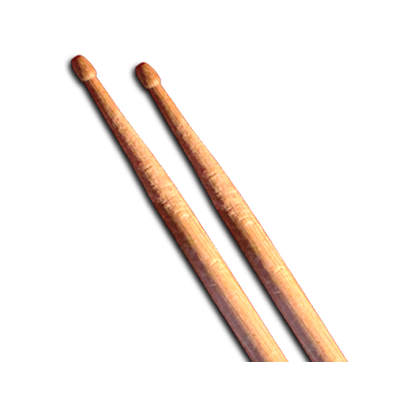 drumsticks, a ¡BANG! sticker, and our eternal gratitude. We will contact you for your size preference. from a previous event with our handwritten thank you on it plus a ¡BANG! 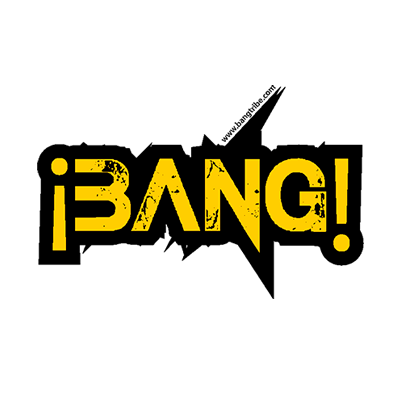 Tshirt, a pair of ¡BANG! drumsticks, a ¡BANG! sticker, and our eternal gratitude. plus a commemorative ¡BANG! 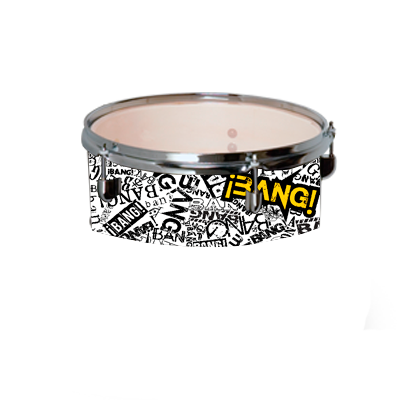 drumhead, a ¡BANG! 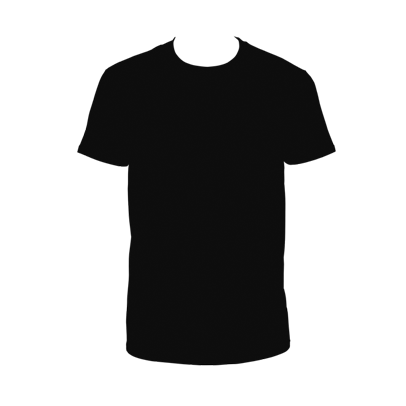 Tshirt, a pair of ¡BANG! drumsticks, a ¡BANG! sticker, and our eternal gratitude. With this money we will be able to purchase an additional set of drums. 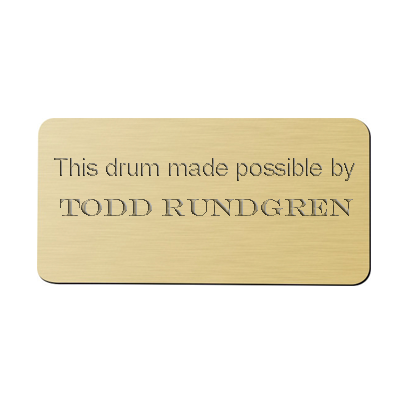 An engraved plaque with your name will be affixed to a drum on the ¡BANG! Tower. You will also receive everything from Level 5. We’ll transport, setup and host a ¡BANG! party at your location within the DFW area pending availability. Travel outside DFW possible, fees to be determined. You will also receive everything from Level 5. Q. Why so many drums? Simply put, more drums = more participation. Drums are interactive, universal, and cross-cultural. From the earliest days of mankind, we have created rhythm. The earliest drums in recorded history date back 8,000 years. Having been used for communication, ritual, and entertainment, we use drums to tap into the primal instincts of participants. Universal, cross-cultural, specialized skill not required, adaptive to the needs of community. Q. Why not use Kickstarter, GoFundMe, or similar? Those sites charge a 5% fee in addition to payment processing fees, and we’d rather spend that money on drums. Q. How much are you trying to raise? Q. How will you spend the money? All money raised will go toward our 2017 Burning Man Festival presentation of ¡BANG! Including, but not limited to: Additional Drums, Improved Mounting System, Hardware, Sound-activated Lighting, Lighted Signs / Aesthetics, Interactive fire art, and consumable items like sticks, and heads, which are replaced often, and fuel. Q. How do we know you’ll do what you say you’ll do? Because we’ve already begun. We already own most of the infrastructure; lots of drums and cymbals, lighting, van and trailer for transportation, PA, projection system, generator, etc. We just need your help to take it to the next level creatively to engage even more participants. ¡BANG! 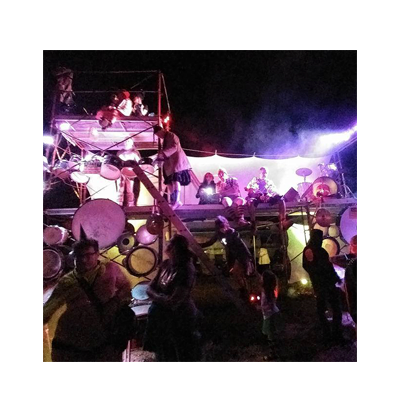 is a tribe, a collective of like-minded individuals striving to tear down the 4th wall between performer and audience, and building community through shared experience. 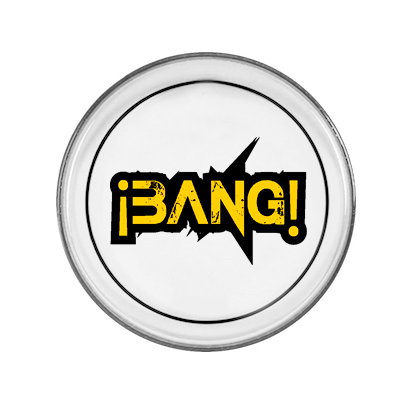 If you are interested in having the ¡BANG! tower at your event, please do not hesitate to contact us. Subscribe to our mailing list for tower updates, party news and more! The ¡BANG! tower's home is located in Dallas, Texas. Please follow us on social media to keep updated on our events and progress. © Copyright ¡BANG! Tribe. All Rights Reserved.